I connected the FT-300 sensor according to the instruction manual using an RS-485 to USB cable to the CB3.0 control box to a UR5. But, when I turn it on, the red LED stays on. I followed the troubleshooting steps detailed by Catherine_Bernier in this thread: https://dof.robotiq.com/discussion/83/how-to-determine-if-my-sensor-is-functional#latest but the data logger just says the device is disconnected. The device manager shows that the device is connected. I am having issues with installing the URCaps for the FT-300, but is there another reason as to why this could be happening? Is there some way to fix this? Probably a compatibility problem between Polyscope and URCap. What versions are installed? 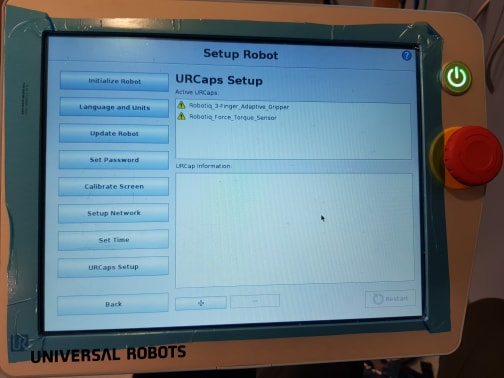 What happens when you install the URCap? Do you get any error message? I don't get any error message but, there is a warning sign (figure attached). This was with UCS1.0.3.